In 1956, Marilyn Monroe, then the most wanted woman on the planet, flew to England to make a film with Laurence Olivier called The Prince and the Showgirl. The hope was that the film would give Marilyn some credibility, but she was an insecure, nervous wreck and didn’t feel up to the task. Reliant on drugs, dependent on her acting coach, and getting little support from her new, third husband (Arthur Miller), Marilyn frustrated Olivier and the crew, and nearly derailed the film entirely. That is, until she struck up a friendship with a production assistant named Colin Clark. The story of Clark’s relationship with Marilyn, brief though it may have been, is the basis of the new film My Week with Marilyn. Clark is a 23-year-old dreamer, and based on this film at least (and the two memoirs Clark wrote in real life), it was he alone who held the key to Marilyn’s sanity and confidence. I doubt that’s entirely true, but then again, Marilyn did make men believe a lot of things. And it’s not hard to see why; the Marilyn of this movie (played by Michelle Williams) is quite alluring. Sporting platinum blonde hair and exuding Marilyn’s seductive charisma and playfulness (at times, anyway), Williams may not look or sound exactly like Marilyn, but she captures Marilyn’s essence and creates a sympathetic portrait of the actress that’s easy to fall in love with. Marilyn knows she has Clark in the palm of her hand, and she takes full advantage until he can serve her needs no longer. Redmayne and Williams are surrounded by an all-star cast, including Kenneth Branagh as Olivier, Julia Ormand, Toby Jones, Dominic Cooper, Judi Dench, and Hermione Granger herself, Emma Watson. As notable as that lineup is, though, this is Williams’ film. And that’s kind of the problem. She’s the one we care about, not Clark. He basically spends the movie in awe of Marilyn, in awe that she even noticed him, and we feel the same. The only one who truly cares about Clark is Watson’s character, and she disappears early on. It makes the film a bit lop-sided, because this is supposed to be Clark’s story, and we’re supposed to be excited for him that he got to spend the time with her (even if it likely meant more to him than to her). 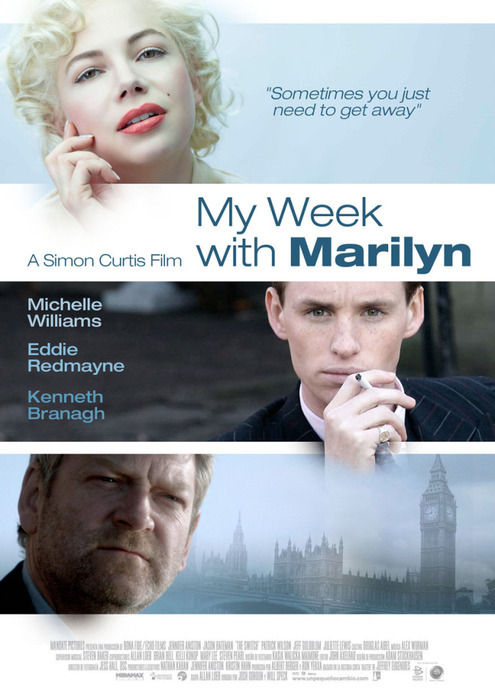 If My Week with Marilyn was as compelling as Williams’ performance, there’d be more to admire. Alas, the film has its focus on the wrong person. And that’s why I’m only giving it a B.